Themes: Fables, morals addressing homework, curfews and television commercials, humor. Friends and friendship, folk tales and myths, comedy, songs and lyrics. What the jacket says: Admit it. You know you’d just love to tell stories about all the annoying, weird, pain-in-the-neck people you know. But you wouldn’t want to be a gossip. Well here’s how it’s done. 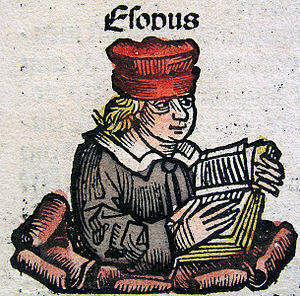 Make like Aesop (and legions of storytellers before him): change the people to animals and add a moral. Now your stories aren’t rude gossip and bad jokes. They’re fables! Jon Scieszka and Lane Smith twisted fairy tales in The Stinky Cheese Man and Other Fairly Stupid Tales. Now they’ve unlocked the ancient secret of animal tales, and the world of fables may never be the same. The moral of the story? If you can’t say something nice about someone, change the guy’s name to Donkey or Squid. Resources: Teacher Guides: http://teacher.scholastic.com/writewit/mff/fractured_fairy_squids.htm this has drop down tabs with pre reading and post reading activities, explanations of fables and fairy tales and is one of many terrific sites for teacher guides. 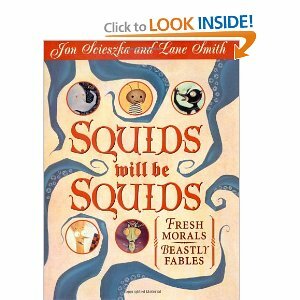 This entry was posted in blogging, Clara Bowman-Jahn, Clarike Bowman-Jahn, Course or Book Review, social networking and tagged Fables, Folklore, Jon Scieszka, Lane Smith, Perfect Picture Book Friday, Squid will be Squid, Susanna Leonard Hill. Bookmark the permalink. I guess I better start looking because I didn’t know we had featured it in February on PPBF. Thanks for adding it to categories. Clar, I’m not sure what is better — the book or your admitted crush. Too cute! I’ll have to check out the guysread.com site. Thanks for making me smile this morning. This sounds like a fun read….I’ll look for it in our children’s library. Thanks for sharing it Clar! I looked at the cover and said, “Hmmm. Interesting. Looks fun.” This, after I read the so cool title. Then I saw the author/illustrator team. Yes. It just had to be. Not quite, “I knew it,” but nearly. Perfect book for the perfect team. I nearly freaked when I discovered my library actually has a copy! Sweet! Their books are usually you would call QUIRKY, for sure! Yes, Quirky is a good term for them. The way they poke fun at all the conventional stories and ways of life is fantastical. Clar, where you at LASCBWI11 last summer when Jon Scieszka did a keynote? That man os so funny, whether you are 2 or 102, he knows how to tell stories that have people rolling. This is a great suggestion! Love the cover art. Jon Scieszka and Lane Smith are an awesome team. “Stinky Cheese” was also a hands down winner. I Facebooked, Twittered, and added it to several GoogleX circles – teachers, bookstores and writers etc. Clar, you keep coming up with the best recommendation. You totally had me with the title. I really appreciate how you find those “just right” books for reluctant readers. It has to do with Jon Scieszka and Lane Smith the magic team. They are the ones all the credit goes to. I started laughing when I read the jacket of the book. What a brilliant idea. This is one very funny book and I will definitely have to check it out. Jon Scieszka and Lane Smith are a winning team! Love your crush on Jon. Great book for boys! Thanks, Patricia. They are the winning team! That’s for sure..
Our family favorite in this book is the one about Pigeon. I’m so glad you’ve read this one, too, it’s such a quirky, funny book!! I’ll have to check out the Pigeon one again. These guys are strange in such a lovely way. I love their books! That is a good proverb to follow. But Jon takes that to the level of if you want to make fun of someone make him into an animal and paint him into a fable, then he/she won’t be able to say it’s about them and they will learn something from it. I think it’s all in the poking fun of things for him. Not vicious but fun. I like that authors are targeting boys as readers. My older son went through a phase where he didn’t like to read and I think it had to do with what he was offered. He has since found a few series/authors that he enjoys so reading is back on his agenda. I know what you mean, Janna. Boys are taught by their peers that reading isn’t cool so they don’t want to read. I am trying to highlight books for boys because my own grand son doesn’t like to read. He just wants to do computer games. However he does like it when Grandpa reads out loud to him. lol. Hi Clar, I was led to your site through Susanna’s PPBF – and I am so glad it did, since we are kindreds in the sense of loving the tandem of Lane Smith and Jon Scieszka. Ten years back, children’s books (or the notion of postmodern picture books) were alien to me, until I discovered The Stinky Cheese Man – and there was no turning back for me at that point. I was hooked on picture books and children’s lit! I have a personal copy of Squids will be Squids as well, can’t stop laughing as I read through it. BRILLIANT! Perfect choice! Oh! Wonderful! A fellow Jon Scieszka fan! so glad to meet you. I am hooked too. I took all of his books out of the library so I could look at them in leisure all at once. No turning back for me either. lol. Clar…great review! Looks like such a funny book…kids will love it…and I’m looking forward to reading it as well. This could be a great book for a unit or discussion on gossiping…which, along with bullying and teasing, causes so many children so much pain. Thanks also for the wonderful resources. Thanks, Vivian. Those resources are good ones for anyone interested in digging a little bit deeper into the book. You are right….Jon Scieszka’s humor and Lane Smith’s art make this a MUST read. I hadn’t heard of it, so thanks for the review!